Australia’s largest urban development’s is under way and Bushmans Industrial Tanks are a core part of ensuring the site, which has had over 170 years of contamination and is now being cleaned up to be ready for construction. Bushmans has designed and supplied custom made industrial tanks for Synergy Resource Managements water treatment system. 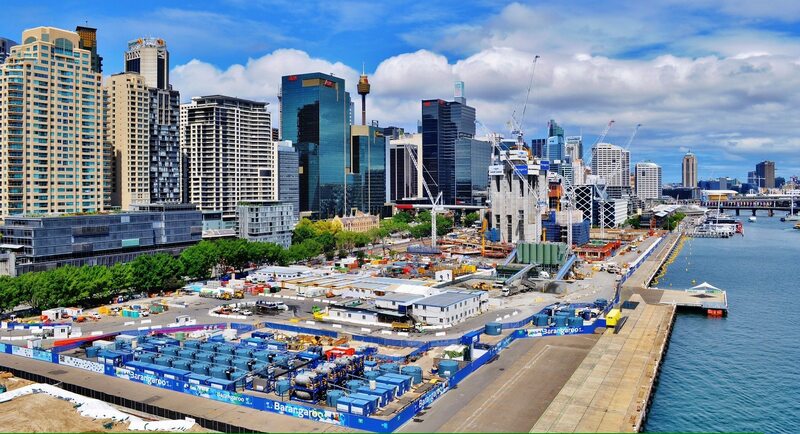 Synergy’s dewatering and water treatment system is enabling the cleanup of the contaminated Barangaroo site adjacent Sydney Harbour which is being developed by the NSW State Government for mixed commercial, residential and open space use. Barangaroo was Australia’s first gasworks providing Sydney’s electricity supply between 1839 and 1928. After that the former gasworks site was used as a commercial wharf extended onto reclaimed harbour front land. All contaminated groundwater and stormwater is being treated by Synergy’s Water Treatment Plant and is not to exceed the environmental protection licence’s strict criteria for discharge into Sydney Harbour. Synergy’s sludge plant is currently being used to supplement the Water Treatment Plant by dewatering waste generated within the Plant. This reduces the waste volume by over 90% enabling conventional transport and disposal of the dewatered sludge offsite to landfill as opposed to liquid waste which is providing immense cost savings. Another key community benefit is the frequency of waste vehicle movements off site is reduced significantly. Once the initial design was complete the system was prototyped and tested to prove all elements of the plant worked effectively and this included ongoing design changes to the tank design and configuration. Bushmans specialist Industrial Division has the capability to build tanks and associated products to support water treatment facilities and project and our experience ranges from water treatment plants, contaminated water systems, coal seam gas projects, desalination plants and chemical storage, manufacturing facilities and hospital waste storage.